There's a Japanese restaurant where? 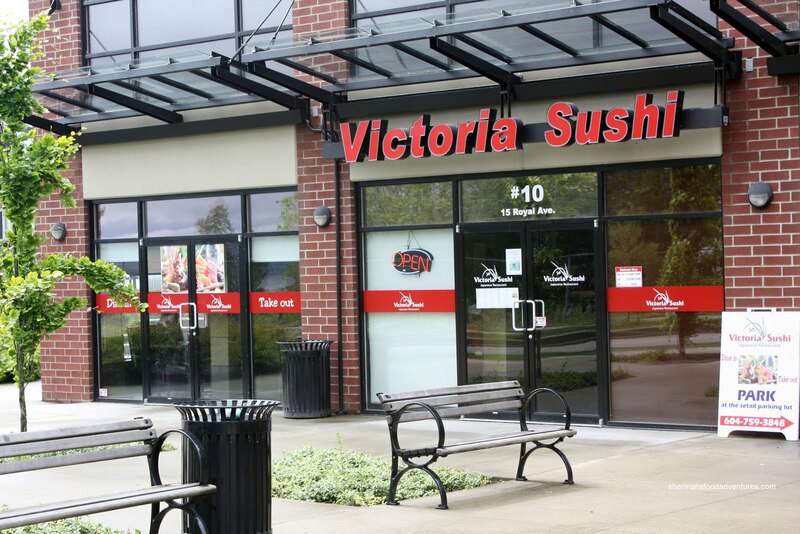 That's what Pomegranate exclaimed when I told him about Victoria Sushi which is located on Queens Ave near McBride. If you know the area well enough, there really isn't much at that address since it is essentially an overpass. When I used Google Maps and Street View to get the scoop on the place, it was an epic fail. What I got was an older apartment building on the West side of McBride. Problem being is that this was neither the right address or the location of Victoria Sushi. Some help Google Maps turned out to be! We ended up parking and searching for the place to no avail. Then I finally used another map and realized it was on the East side of McBride on Queens. When we made our way into the relatively new condo developments, it sure didn't seem like a Japanese restaurant would be found. Yet, lo and behold, there it was, on the ground floor of a high-rise condominium. Problem being is... where to park? There is practically no street parking around, although there is underground parking available. We didn't go for that because we were able to snag one of the precious few street spots. de spite the appearance of too much batter. I guess the fact we ate it up right away helped. Included in the dinner for 2 was the daily special which was the Korokke. I couldn't make out all of the ingredients; but what I could gather, it was made of pork, peppers and onions. 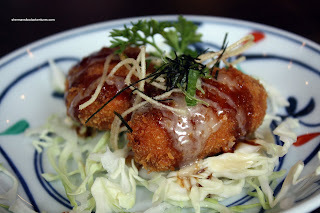 We really liked the crispy panko crust; however, I felt that the filling was a bit on the dry side. It did taste pretty good with the natural sweetness from red peppers and onion. 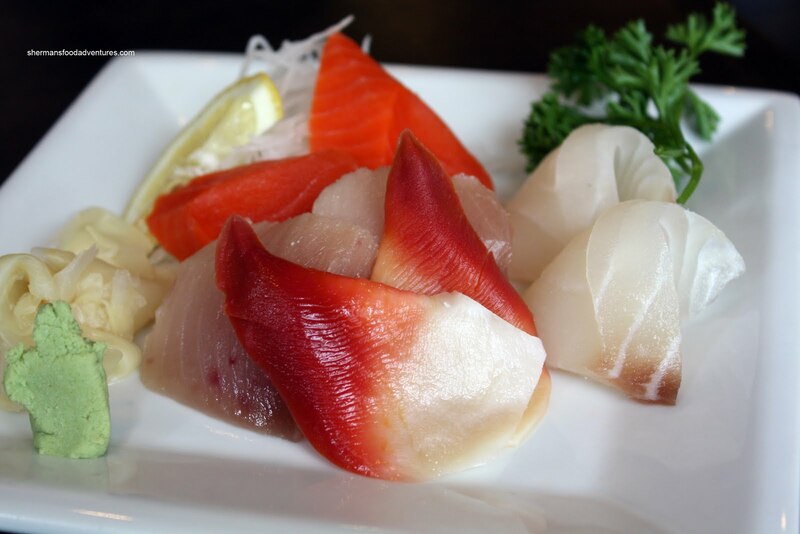 Next up was the assorted Sashimi which included 2 pieces each of wild salmon, tuna, hokkigai and halibut. Nothing much to say here other than it was good. Fish looked and smelled fresh. Texturally it was good too, the flesh exhibited a nice bounce. However, I cannot say many nice things about the Gyoza though. We found the skin to be much too doughy and hard. It was equivalent of eating cardboard. 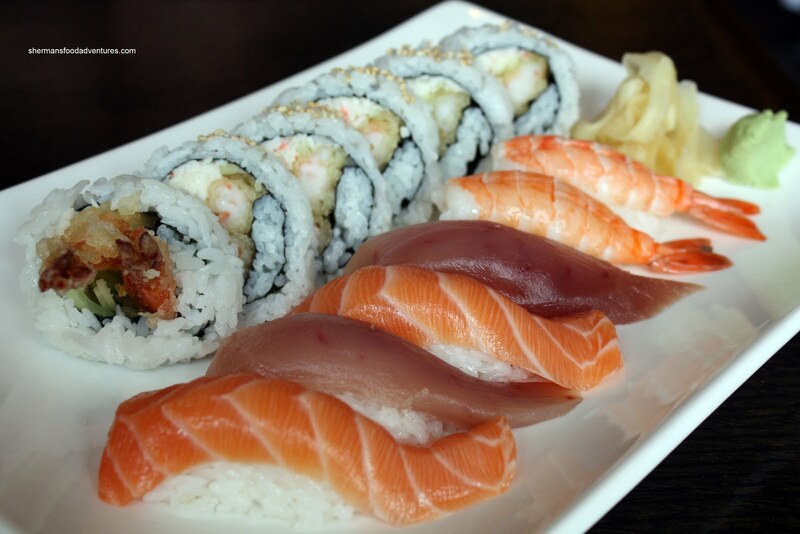 Arriving on the same platter, we got a Dynamite Roll and 2 pieces each of salmon, tuna and ebi Nigiri. 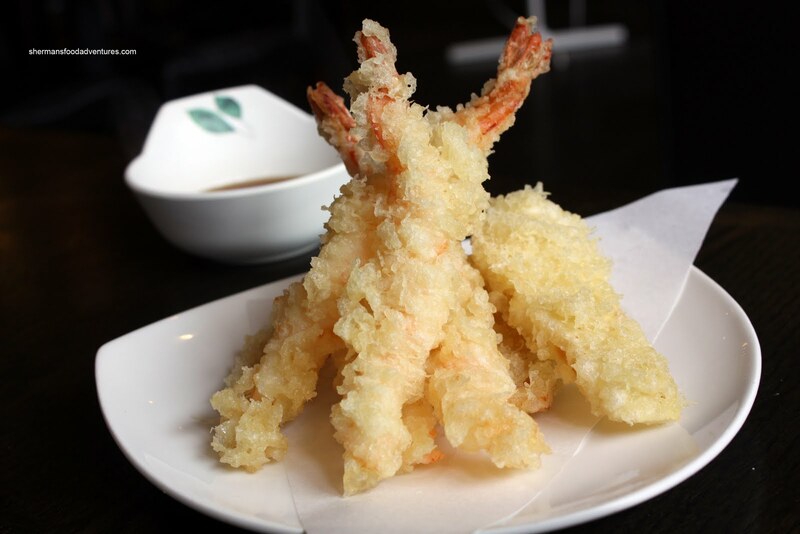 With the freshness of the ingredients already established, the rice was my next focus. Taking bites into the roll and nigiri, the rice did exhibit good "rebound", albeit on the drier side. There was some vinegar flavour; but only a little bit. So with decent rice and fresh ingredients, both items worked out well. I liked that the ebi tempura in the dynamite roll still retained some crispiness. If that wasn't enough food already, there was more. 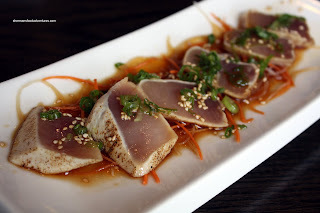 The Tuna Tataki arrived on a long plate and it looked quite appetizing. With a perfectly uniform sear on the outside swimming in a vinaigrette (not ponzu), this was pretty decent. 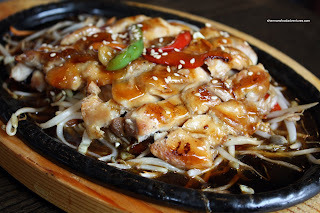 Finally, we got to our very last dish which was the Chicken Teriyaki. Served on a cast iron plate (which was not really sizzling, thus negating its purpose), this was a pretty large portion. We felt that this was a miss. First, the chicken was overcooked resulting in a dry product. Second, I wasn't all that fond of the red and green peppers in the teriyaki sauce. It completely changed the flavour profile and overwhelmed the other components. 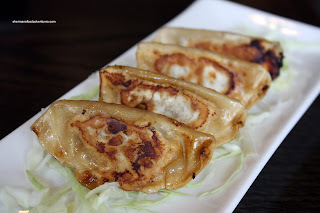 Not that we needed any; but it would've went well with some steamed rice. Curiously, we got one more item after this even though we were certain that our meal was over. It was quite apparent that they forgot to give us our Sunomono Salad at the start of the meal. Therefore, we unexpectedly got it the very end. We're not that picky in that respect, so it didn't really bother us; however, an explanation would've help. It was just plopped on our table hurriedly. However, that was the only hiccup regarding the service. Besides, one person can only handle so much without making an error. She did the best she could with a good attitude. In terms of the food, it was mostly good mixed in with some not-so-good. But given the pricing, portion-size and general quality of the food, Victoria Sushi is a decent choice out in New West. Well, you have to admit the ones that worked (specially the sushi) actually looks good. Just in case, an idea of $$$ for reference purposes? (Insert random joke of you and Pomegranta sharing the meal, hehehehe). ....my sister lives in this area! I can't believe you found my other Japanese hideout of a spot. This area is pretty new and google maps will fail at finding it. What other map system did you use? Kim, some of the stuff was good and some was not... Pricewise, it was pretty reasonable; yet not exactly cheap. I would say it is priced similarly to King and Ki Sushi. Kevin, then you have to go there and eat with your sister!